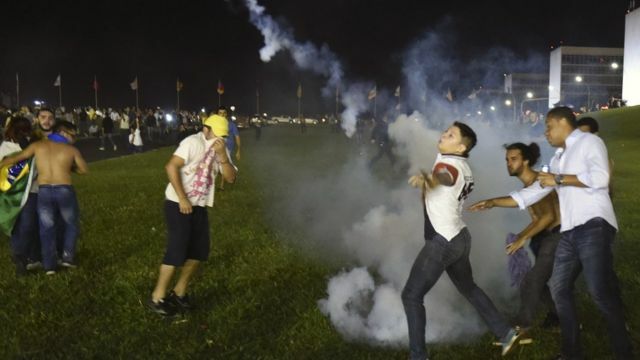 Brazil protests after Lula appointment Jump to media player Protests have erupted in Brazil after the country's former President, Luiz Inacio Lula da Silva, was announced chief of staff for the current President Dilma Rousseff. Brazilian families divided over Lula Jump to media player How one Brazilian family is divided in their views on ex-President Luiz Inacio Lula da Silva's brush with the law. Charges filed against Brazil's Lula Jump to media player Brazilian prosecutors are filing charges against ex-President Luiz Inacio Lula da Silva in a money laundering probe, officials say. Brazil's president visits embattled Lula Jump to media player Brazil's President Dilma Rousseff has visited her predecessor, Luiz Inacio Lula da Silva, a day after he was questioned as part of a corruption investigation. Protests have erupted in Brazil after the country's former President, Luiz Inacio Lula da Silva, was announced chief of staff for the current President Dilma Rousseff. The move shields Lula from possible prosecution by a federal judge investigating a massive corruption scandal named Operation Car Wash.
Police say 2,500 people have gathered outside the presidential palace in the capital of Brasilia, with others demonstrating on Sao Paulo's main Avenue Paulista.